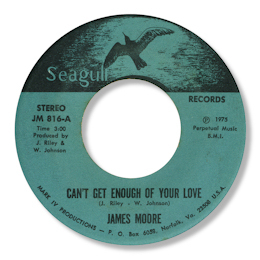 If anybody thought that the sort of high octane singing that artists like Wilson Pickett and Sam & Dave pioneered in the early 60s had disappeared by the time that the disco boom hit it’s height here’s James Moore from Norfolk, VA to set the record straight. Can’t Get Enough Of Your Love could have been cut in Memphis in 1967, the slight disco beat from the drummer aside, and the way Moore screams his way through it is simply electrifying. Powerful Love is a great deep performance to be sure, especially the heavy gospel influence towards the end – but it really is far too short at under 2 minutes. 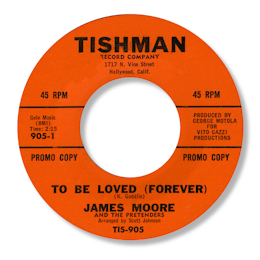 Although the Tishman 45 credited to James Moore was released by a label from from Hollywood, CA the vocalist shows enough fire and grit to suggest it may well be the same artist. “A Man Should Never Cry” is a “Stand By Me” clone that the dancers are keen on, while “To Be Loved (Forever)” is an early soul ballad rather overburdened by strings and an intrusive female chorus. Moore’s Soft 45 is a version of “My Elusive Dreams” the country song that is best known in soul circles for the Moses & Joshua Dillard cut on Mala. It’s no disrespect to that disc to say that Moore sings the song at least as well as the “Dillards” do. So it will come as no surprise to hear that “Joshua Dillard “ has been indentified in several quarters as James Moore. The dissenting voice comes from Papa Don Schroeder, the producer of the Mala 45 who has told my friend Red Kelly via his excellent blog here that "Joshua Dillard" was in fact Jesse Boyce with whom Moses Dillard recorded in the 70s. Now I wouldn't dream of questioning that source but I am puzzled. The "James Moore" track "Feet" is si close to the Mala 45 in both the instrumentation and the vocals that it could even be an outtake from the same session. 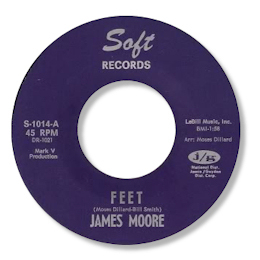 If it isn't James Moore singing why is the Soft 45 credited to him? And if it isn't him who is it?? UPDATE ~ Davie Gordon writes to say that "I'm pretty sure the James Moore on Tishman is a different guy. I think he's the James Moore who was in the original Young Hearts, the Los Angeles group who had hits on Minit. I think he's the James Moore who was in the original Young Hearts, the Los Angeles group who had hits on Minit. The first Young Hearts release was on the LA based Infinity label and was produced, like the Tishman single, by George Motola. I'm not sure if Moore's on the Infinity single but he ws definitely there on the Minit tracks as his name crops up in the writer credits. The Minit group broke up in late '69 - Moore left along with Earl Carter, two of the other members James Ingersoll and Ron Preyer brought in a new member Bobby Solomon and continued as a trio. I lost track of Moore after that." Davie adds that "as for the Soft single, given that Soft was one of Major Bill Smith's labels and that Moses Dillard did a lot of work for Smith it wouldn't surprise me if it actually IS a Mala outtake. Maybe the artist credit was given as "James Moore" so that Papa Don wouldn't notice." As ever I'm grateful to Davie for sharing his vast knowledge of soul with me. Note ~ I understand that there might have been an LP on Seagull as well but I do not have any details of this. Can anybody help?